Template:Hinduism small Hinduism is the predominant and indigenous religious tradition of South Asia. Hinduism is often referred to as Sanātana Dharma (a Sanskrit phrase meaning "the eternal law") by its adherents. Generic "types" of Hinduism that attempt to accommodate a variety of complex views span folk and Vedic Hinduism to bhakti tradition, as in Vaishnavism. Hinduism also includes yogic traditions and a wide spectrum of "daily morality" based on the notion of karma and societal norms such as Hindu marriage customs. Demographically, Hinduism is the world's third largest religion, after Christianity and Islam, with more than a billion adherents, of whom approximately 1 billion, live in India. Other significant populations are found in Nepal (23 million), Bangladesh (14 million) and the Indonesian island of Bali (3.3 million). The word Hindu is derived from the Sanskrit word Sindhu, the historic local appellation for the Indus River in the northwestern part of the Indian subcontinent. and is first mentioned in the Rig Veda The usage of the word Hindu was further popularized by the Arabic term al-Hind referring to the land of the people who live across river Indus. By the 13th century, Hindustān emerged as a popular alternative name of India, meaning the "land of Hindus". Originally, Hindu was a secular term which was used to describe all inhabitants of the Indian subcontinent (or Hindustan) irrespective of their religious affiliation. It occurs sporadically in some 16th-18th century Bengali Gaudiya Vaishnava texts, including Chaitanya Charitamrita and Chaitanya Bhagavata, usually to contrast Hindus with Yavanas or Mlecchas. It was only towards the end of the 18th century that the European merchants and colonists referred collectively to the followers of Indian religions as Hindus. Eventually, it came to define a precisely religious identity that includes any person of Indian origin who neither practiced Abrahamic religions nor non-Vedic Indian religions, such as Jainism, Sikhism or Buddhism, thereby encompassing a wide range of religious beliefs and practices related to Sanātana Dharma. The earliest evidence for prehistoric religion in India date back to the late Neolithic in the early Harappan period (5500–2600 BCE). The beliefs and practices of the pre-classical era (1500–500 BCE) are called the "historical Vedic religion". Modern Hinduism grew out of the Vedas, the oldest of which is the Rigveda, dated to 1700–1100 BCE. The Vedas center on worship of deities such as Indra, Varuna and Agni, and on the Soma ritual. Fire-sacrifices, called yajña were performed, and Vedic mantras chanted but no temples or icons were built. The oldest Vedic traditions exhibit strong similarities to Zoroastrianism and other Indo-European religions. Hinduism as we know it can be subdivided into a number of major currents. Of the historical division into six darshanas, only two schools, Vedanta and Yoga survive. The main divisions of Hinduism today are Vaishnavism, Shaivism, Smartism and Shaktism. Hinduism also recognizes numerous divine beings subordinate to the Supreme Being or regards them as lower manifestations of it. Other notable characteristics include a belief in reincarnation and karma, as well as in personal duty, or dharma. The characteristic of comprehensive tolerance to differences in belief, and Hinduism's openness, makes it difficult to define as a religion according to traditional Western conceptions. To its adherents, Hinduism is the traditional way of life, and because of the wide range of traditions and ideas incorporated within or covered by it, arriving at a comprehensive definition of the term is problematic. While sometimes referred to as a religion, Hinduism is more often defined as a religious tradition. It is therefore described as both the oldest of the world's religions, and the most diverse. Most Hindu traditions revere a body of religious or sacred literature, the Vedas, although there are exceptions. Some Hindu religious traditions regard particular rituals as essential for salvation, but a variety of views on this co-exist. Some Hindu philosophies postulate a theistic ontology of creation, of sustenance, and of destruction of the universe, yet some Hindus are atheists. Hinduism is sometimes characterized by the belief in reincarnation (samsara), determined by the law of karma, and the idea that salvation is freedom from this cycle of repeated birth and death. However, other religions of the region, such as Buddhism, Jainism and Sikhism, also believe in karma, outside the scope of Hinduism. Hinduism is therefore viewed as the most complex of all of the living, historical world religions. Despite its complexity, Hinduism is not only one of the numerically largest faiths, but is also the oldest living major tradition on earth, with roots reaching back into prehistory. A definition of Hinduism is further complicated by the frequent use of the term "faith" as a synonym for "religion". Some academics and many practitioners refer to Hinduism using a native definition, as Sanātana Dharma, a Sanskrit phrase meaning "the eternal law", or the "eternal way". Hinduism is a diverse system of thought with beliefs spanning monotheism, polytheism, panentheism, pantheism, monism, atheism, agnosticism, gnosticism among others; and its concept of God is complex and depends upon each particular tradition and philosophy. It is sometimes referred to as henotheistic (i.e., involving devotion to a single god while accepting the existence of others), but any such term is an overgeneralization. Mokṣa ("liberation, freedom (from samsara)". Pilgrimage is not mandatory in Hinduism, though many adherents undertake them Hindus recognise several Indian holy cities, including Allahabad, Haridwar, Varanasi, and Vrindavan. Notable temple cities include Puri, which hosts a major Vaishnava Jagannath temple and Rath Yatra celebration;and Katra, home to the Vaishno Devi temple. The four holy sites Puri, Rameswaram, Dwarka, and Badrinath (or alternatively the Himalayan towns of Badrinath, Kedarnath, Gangotri, and Yamunotri) compose the Char Dham (four abodes) pilgrimage circuit. The Kumbh Mela (the "pitcher festival") is one of the holiest of Hindu pilgrimages that is held every four years; the location is rotated among Allahabad, Haridwar, Nashik, and Ujjain. Another important set of pilgrimages are the Shakti Peethas, where the Mother Goddess is worshipped, the two principal ones being Kalighat and Kamakhya.Two comparatively recent temples of fame and huge pilgrimage are Tirumala - Tirupati, home to the Tirumala Venkateswara Temple; Sabarimala,where Swami Ayyapan is worshipped. While there are different yet similar pilgrimage routes in different parts of India all are respected equally well according to the universality of Hinduism. The Vaishnava Tirumala Venkateswara Temple the most visited and richest Hindu temple in the world. There are movements that are not easily placed in any of the above categories, such as Swami Dayananda Saraswati's Arya Samaj, which rejects image worship and veneration of multiple deities. It focuses on the Vedas and the Vedic fire sacrifices (yajña). Hindus and scholars debate whether the so-called caste system is an integral part of Hinduism sanctioned by the scriptures or an outdated social custom. Among the scriptures, the Varna system is mentioned sparingly and descriptively (i.e., not prescriptive); apart from a single mention in the late Rigvedic Purusha sukta, the rigid division into varnas appears to be post-Vedic, appearing in classical texts from the Maurya period. The Bhagavad Gītā (4.13) states that the four varṇa divisions are created by God, and the Manusmṛiti categorizes the different castes. However, at the same time, the Gītā says that one's varṇa is to be understood from one's personal qualities and one's work, not one's birth. Some mobility and flexibility within the varnas challenge allegations of social discrimination in the caste system, as has been pointed out by several sociologists. Hindus advocate the practice of ahiṃsā (non-violence) and respect for all life because divinity is believed to permeate all beings, including plants and non-human animals. The term ahiṃsā appears in the Upanishads, the epic Mahabharata and Ahiṃsā is the first of the five Yamas (vows of self-restraint) in Patanjali's Yoga Sutras. In accordance with ahiṃsā, many Hindus embrace vegetarianism to respect higher forms of life. Vegetarianism is propagated by the Yajur Veda and it is recommended for a satvic (purifying) lifestyle. Estimates of the number of lacto vegetarians in India (includes adherents of all religions) vary between 20% and 42%. The food habits vary with the community and region, for example some castes having fewer vegetarians and coastal populations relying on seafood. Some Hindus avoid onion and garlic, which are regarded as rajasic foods. Some avoid meat only on specific holy days. Observant Hindus who do eat meat almost always abstain from beef. The cow in Hindu society is traditionally identified as a caretaker and a maternal figure, and Hindu society honours the cow as a symbol of unselfish giving. Cow-slaughter is legally banned in almost all states of India. Some Hindus from certain sects - generally Shakta, certain Shudra and Kshatriya castes and certain Eastern Indian and East Asian regions; practise animal sacrifice (bali). Although most Hindus, including the majority of Vaishnava and Shaivite Hindus abhor it. Concepts of conversion, evangelization, and proselytization in practice have never played a significant role in the religion. Early in its history, in the absence of other competing religions, Hindus considered everyone they came across as Hindus and expected everyone they met to be Hindus. In general, Hindu view of religious freedom is not based on the freedom to proselytize, but the right to retain one's religion and not be subject to proselytization. Hindu leaders are advocating for changing the existing formulation of the freedom of religion clause in the Universal Declaration of Human Rights since it favours religions which proselytize. ^ a b Hinduism is variously defined as a "religion", "set of religious beliefs and practices", "religious tradition" etc. For a discussion on the topic, see: "Establishing the boundaries" in Gavin Flood (2003), pp. 1-17. René Guénon in his Introduction to the Study of the Hindu Doctrines (1921 ed. ), Sophia Perennis, ISBN 0-900588-74-8, proposes a definition of the term "religion" and a discussion of its relevance (or lack of) to Hindu doctrines (part II, chapter 4, p. 58). ^ Laderman, Gary (2003), Religion and American Cultures: An Encyclopedia of Traditions, Diversity, and Popular Expressions, Santa Barbara, Calif: ABC-CLIO, pp. 119, ISBN 1-57607-238-X, "world's oldest living civilization and religion"
^ Turner, Jeffrey S. (1996), Encyclopedia of relationships across the lifespan, Westport, Conn: Greenwood Press, pp. 359, ISBN 0-313-29576-X, "It is also recognized as the oldest major religion in the world"
^ "Major Religions of the World Ranked by Number of Adherents". Adherents.com. http://www.adherents.com/Religions_By_Adherents.html. Retrieved 2007-07-10. ^ O'Conell, Joseph T. (1973). 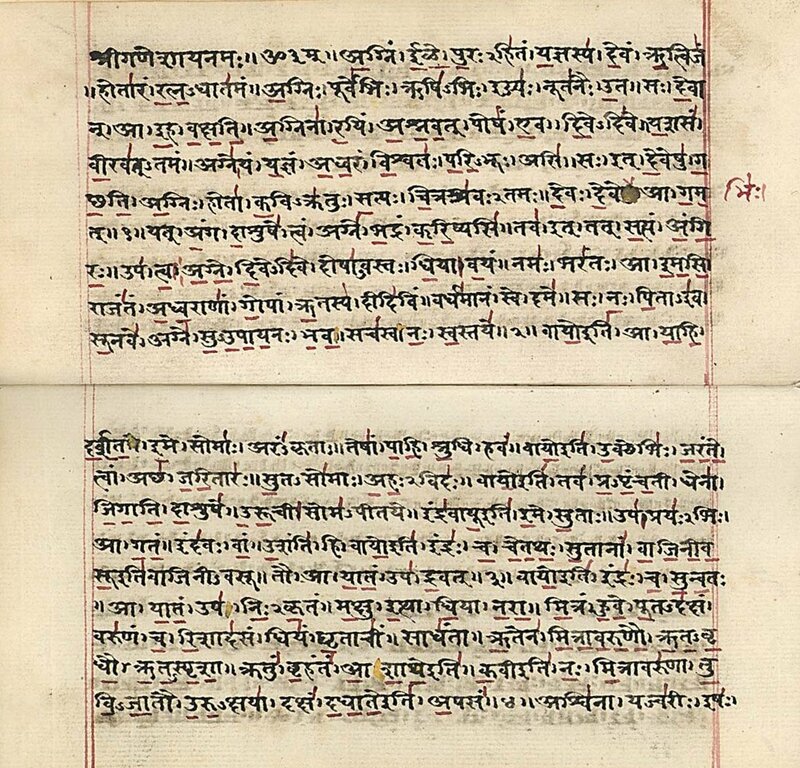 "The Word 'Hindu' in Gauḍīya Vaiṣṇava Texts". Journal of the American Oriental Society 93 (3): pp. 340–344. ^ "...that many-sided and all-enfolding culture which we in the West have chosen to call Hinduism" Jan Gonda, Visnuism and Sivaism, Munshiram Manoharlal. 1996, ISBN 812150287X p. 1. cited by Welbon, G.R. (Journal of the American Academy of Religion, Vol. 43, No. 1, 98+100. March, 1975. ), Review: Love of God According to Saiva Siddhanta: A Study in the Mysticism and Theology of Saivism by Mariasusay Dhanamoy. ^ "Hindu History" The BBC names a bath and phallic symbols of the Harappan civilization as features of the "Prehistoric religion (3000-1000 BCE)". ^ T. Oberlies (Die Religion des Rgveda, Vienna 1998. p. 158) based on 'cumulative evidence' sets wide range of 1700–1100. ^ The Ṛgvedic deity Dyaus, regarded as the father of the other deities, is linguistically cognate with Zeus—the king of the gods in Greek mythology, Iovis (gen. of Jupiter) —the king of the gods in Roman mythology, and Tiu/Ziu in Germanic mythology, cf. English 'Tues-day'. Other Vedic deities also have cognates with those found in other Indo-European speaking peoples' mythologies; see Proto-Indo-European religion. ^ "The rise of Jainism and Buddhism". Religion and Ethics—Hinduism: Other religious influences. BBC. 26 July 2004. http://www.bbc.co.uk/religion/religions/hinduism/history/history_2.shtml. Retrieved 2007-04-21. ^ Vijay Nath, From 'Brahmanism' to 'Hinduism': Negotiating the Myth of the Great Tradition, Social Scientist 2001, pp. 19-50. ^ Adherents.com, which itself references many sources; The World Almanac & Book of Facts 1998 being especially relevant. ^ OED cites J. Davies, tr. Mandelslo's Trav. 74 (1662) The King of Cambaya, who was a Hindou, or Indian, that is, a Pagan. and Sir T. Roe's Voy. E. Ind. in P. della Valle's Trav. E. Ind. 374 (1665) The Inhabitants in general of Indostan were all anciently Gentiles, called in general Hindoes. ^ Bryan S. Turner "Essays on the Sociology of Fate - Page 275"
^ Vaz, P. (2001), "Coexistence of Secularism and Fundamentalism in India", Handbook of Global Social Policy (CRC Press): 124, ISBN 9780824703578, http://books.google.com/?id=opHYPSvPpWYC&pg=PA123&dq=oldest+major+tradition+Hinduism, retrieved 2008-06-26, "Hinduism is the oldest of all the major world religions." ^ "JSTOR: Philosophy East and West, Vol. 34, No. 2 (April, 1984 ), pp. 234-236". www.jstor.org. http://www.jstor.org/pss/1398925. ^ Hinduism in Britain Kim Knott, (2000) The South Asian Religious Diaspora in Britain, Canada, and a United States. ^ Weightman 1998, pp. 262–264 "It is Hindu self-awareness and self-identity that affirm Hinduism to be one single religious universe, no matter how richly varied its contents, and make it a significant and potent force alongside the other religions of the world." ^ Olson, Carl (2007). The many colors of Hinduism: a thematic-historical introduction. Rutgers University Press. p. 9. ISBN 9780813540689. http://books.google.com/books?id=RVWKClYq4TUC&pg=PA9. ^ Andrews, Margaret; Boyle, Joyceen (2008). Transcultural concepts in nursing care. Lippincott Williams & Wilkins. p. 386. ISBN 9780781790376. http://books.google.com/books?id=rdEnV1HWrvgC&pg=PA386. ^ Dogra, R.C; Dogra, Urmila (2003). Let's know Hinduism: the oldest religion of infinite adaptability and diversity. Star Publications. p. 5. ISBN 9788176500562. http://books.google.com/books?id=mpzqP4NYyTkC&pg=PA5. ^ "India and Hinduism". Religion of World. ThinkQuest Library. http://library.thinkquest.org/28038/page1_3.html. Retrieved 2007-07-17. ^ "Polytheism". Encyclopædia Britannica. Encyclopædia Britannica Online. 2007. http://www.britannica.com/eb/article-38143/polytheism. Retrieved 2007-07-05. ^ See Michaels 2004, p. xiv and Gill, N.S. "Henotheism". About, Inc. http://ancienthistory.about.com/cs/egyptmyth/g/henotheism.htm. Retrieved 2007-07-05. ^ For translation of deva in singular noun form as "a deity, god", and in plural form as "the gods" or "the heavenly or shining ones", see: Monier-Williams 2001, p. 492. In fact, there are different ranks among the devas. 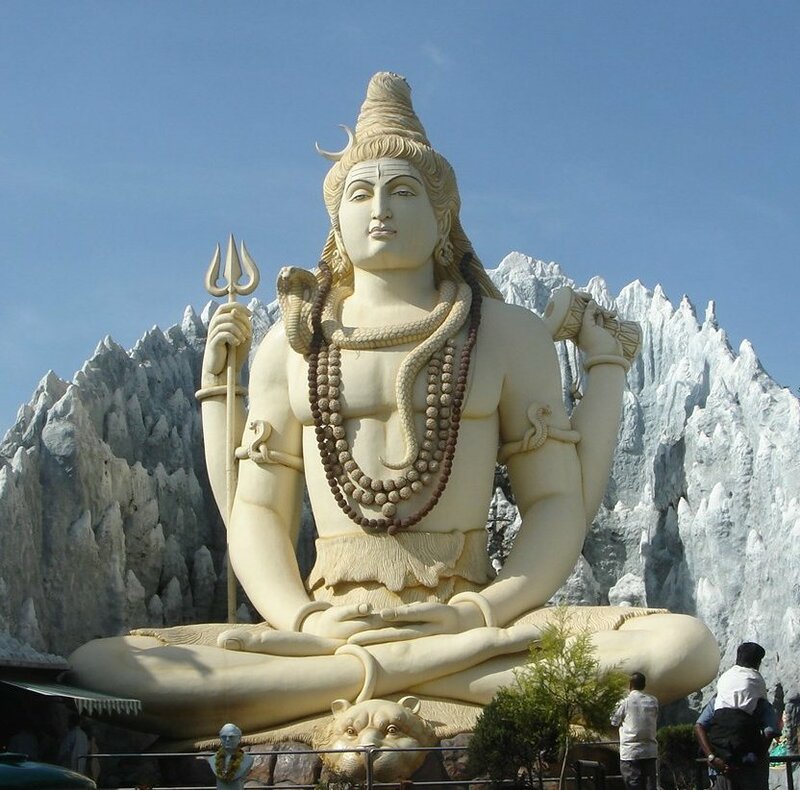 The highest are the immortal Mahadevas, such as Shiva, Vishnu, etc. The second-rank devas, such as Ganesha, are described as their offspring: they are "born", and their "lifespan" is quite limited. In ISKCON the word is translated as "demigods", although it can also denote such heavenly denizens as gandharvas. See: "Vedic cosmology". Vedic Knowledge Online. VEDA - Bhaktivedanta Book Trust. http://www.veda.harekrsna.cz/planetarium/index.htm. Retrieved 2007-06-25. . For translation of devatā as "godhead, divinity", see: Monier-Williams 2001, p. 495. ^ "Hinduism - Euthanasia and Suicide". BBC. 2009-08-25. http://www.bbc.co.uk/religion/religions/hinduism/hinduethics/euthanasia.shtml. ^ The Christian concepts of Heaven and Hell do not translate directly into Hinduism. Spiritual realms such as Vaikunta (the abode of Vishnu) or loka are the closest analogues to an eternal Kingdom of God. ^ arcye viṣṇau śīlā-dhīr. . . narakī saḥ. ^ "Religious Life". Religions of India. Global Peace Works. http://www.religionsofindia.org/loc/india_religious_life.html. Retrieved 2007-04-19. ^ a b c d "Domestic Worship". Country Studies. The Library of Congress. September 1995. http://lcweb2.loc.gov/cgi-bin/query/r?frd/cstdy:@field(DOCID+in0055). Retrieved 2007-04-19. ^ "Hindu Marriage Act, 1955". http://www.sudhirlaw.com/HMA55.htm. Retrieved 2007-06-25. ^ a b "Life-Cycle Rituals". Country Studies: India. The Library of Congress. September 1995. http://lcweb2.loc.gov/cgi-bin/query/r?frd/cstdy:@field(DOCID+in0056). Retrieved 2007-04-19. ^ Banerjee, Suresh Chandra. "Shraddha". Banglapedia. Asiatic Society of Bangladesh. http://banglapedia.search.com.bd/HT/S_0516.htm. Retrieved 2007-04-20. ^ See, for instance, René Guénon Man and His Becoming According to the Vedanta (1925 ed. ), Sophia Perennis, ISBN 0-900588-62-4, chapter 1, "General remarks on the Vedanta, p.7. ^ Note: Nyaya-Vaisheshika believe that the Vedas were created by God, not eternal. ^ "Swami Shivananda's mission". http://www.dlshq.org/religions/vedas.htm. Retrieved 2007-06-25. ^ Sarvopaniṣado gāvo, etc. (Gītā Māhātmya 6). Gītā Dhyānam, cited in Introduction to Bhagavad-gītā As It Is. ^ This view is supported by records of sages who became Brahmins. For example, the sage Vishvāmitra was a king of the Kṣhatriya caste, and only later became recognized as a great Brahmin sage, indicating that his caste was not determined by birth. Similarly, Vālmiki, once a low-caste robber, became a sage. ^ For text of Y.S. 2.29 and translation of yama as "vow of self-restraint", see: Taimni, I. K. (1961), The Science of Yoga, Adyar, India: The Theosophical Publishing House, ISBN 81-7059-212-7 , p. 206. ^ Surveys studying food habits of Indians include: "Diary and poultry sector growth in India", "Indian consumer patterns" and "Agri reform in India". Results indicate that Indians who eat meat do so infrequently with less than 30% consuming non-vegetarian foods regularly, although the reasons may be economical. ^ Yadav, Y.; Kumar, S (August 14, 2006). "The food habits of a nation". The Hindu. http://www.hindu.com/2006/08/14/stories/2006081403771200.htm. Retrieved 2006-11-17. ^ See, Basak, R., "The Hindu concept of the natural world" in Morgan 1987, pp. 111–112; see also Doshi, Malvi (2002), Cooking Along the Ganges: The Vegetarian Heritage of India, Writer's Showcase Press, ISBN 059524422X p. 2. ^ Krishnakumar, R. (August 30-September 12, 2003). "Beef without borders". Frontline (Narasimhan Ram). http://www.hinduonnet.com/fline/fl2018/stories/20030912004703100.htm. Retrieved 2006-10-07. ^ Smith, David Whitten; Burr, Elizabeth Geraldine (28 Dec 2007). "One". Understanding world religions: a road map for justice and peace. Rowman & Littlefield. p. 12. ISBN 0742550559. ^ Kamphorst Janet (5 Jun 2008). "9". In praise of death: history and poetry in medieval Marwar (South Asia). Leiden University Press. p. 287. ISBN 9087280440. ^ Fuller Christopher John (2004). "4". The camphor flame: popular Hinduism and society in India (Revised and Expanded Edition ed.). Princeton University Press. p. 83. ISBN 978-0-691-12048-5. http://press.princeton.edu/titles/7823.html. ^ Gouyon Anne; Bumi Kita Yayasan (30 Sep 2005). "The Hiden Life of Bali". The natural guide to Bali: enjoy nature, meet the people, make a difference. Equinox Publishing (Asia) Pte Ltd. p. 51. ISBN 9793780002. http://bookshop.blackwell.co.uk/jsp/welcome.jsp?action=search&type=isbn&term=9793780002. Retrieved 12 August 2010. ^ "Religious or Secular: Animal Slaughter a Shame" (in English). The Hindu American foundation. 2009. This page uses content from the English language Wikipedia. The original content was at Hinduism. The list of authors can be seen in the page history. As with this Familypedia wiki, the content of Wikipedia is available under the Creative Commons License.